BIP 173 proposed a checksummed base32 format, Bech32 and a standard for native segregated witness output addresses using it to replace BIP 142. This format is not required for using segwit, but is more efficient, flexible and nicer to use. The human-readable part(hrp), which is intended to convey the type of data, or anything else that is relevant to the reader. The separator which is always “1”. In case “1” is allowed inside the hrp, the last one in the string is the separator. The data part, which is at least 6 characters long and only consists of alphanumeric characters excluding “1”, “b”, “i”, “o”. The last six characters of the data part form a chechsum and contain no information. The human-readable part “bc” for mainnet and the “tb” for testnet. Start with the bits of the witness program, most significant bit per btye first. Re-arrange those bits into groups of 5, and pad with zeros at the end if needed. Translate those bits to characters. a system for deriving a tree of keypairs from a single seed. demostrate how to build a wallet structure on top of such a tree. Addition (+) of two coordinate pair is defined as application of the EC group operation. Concatenation(||) is the operation of appending one byte sequence onto another. We are going to define a function to derive a number of child keys from a parent key. In order to prevent these from depending solely on the key itself, we extend both private key and public key first with an extra 256 bits of entropy. This extention, called the chain code, is identical for corresponding private key and public keys, and consist of 256 bits, namely 32 bytes. We represent an extended private key as (k, c), with k the normal private key and the c, the chain code. And extended public key is represented as (K, c), with K = point(k) and the c the chain code. Each extended key has 2^31 normal child keys, and 2^31 hardened child keys. Each of these child keys has an index. The normal child keys use indices 0 through 2^31 - 1. The hardened child keys use indices 2^31 - 1 through 2^32 - 1. To ease notation for hardened key indices, a number i_H represents i + 2 ^ 31. Given a parent extended key and an index i, it is possible to compute the corresponding child extended key. The algorithm to do so depends on whether the child is a hardened key or not. The function CKDpriv((k_par, c_par), i) => (k_i, c_i) computes a child extended private key from the parent extended private key. Split I into two 32-byte sequences, I_L, and I_R. The next step is cascading serveral CKD construction to build a tree. We start with one root, the master extended key m. By evaluating CKBpriv(m, i) for several values of i, we get a number of level-1 derived nodes. As each of these is again an extended key, CKDpriv can be applied to those as well. However, N(m/a_H) cannot be rewritten as N(m)/a_H, as the latter is not possible. Extended keys can be identified by the Hash160(RIPED160 after SHA256) of the serialized ECDSA public key K, ignoring the chain code. This corresponds exactly to the data used in traditional Bitcoin addresses. It is not advised to represent this data in base58 format though, as it may be interpreted as an address that way. The first 32 bits of the identifier are called key finterprint. 1 byte: depth: 0x00 for master nodes, 0x01 for level-1 derived keys. The 78 bytes structure can be encoded like other Bitcoin data in Base58, by first adding 32 checksum bits(derived from the double SHA256 checksum), and then conventing to the Base58 representation. The total number of possible extended keypairs is almost 2^512, but the produced keys are only 256 bits long, and offer about half of that in terms of security. Therefore the master keys are not generated directly, but instead from a potentially short seed value. Generate a seed byte sequence S of a chosen length(between 128 and 512 bits, 256 bits is advised) from a (P)RNG. Use parse_256(I_L) as master secret key and I_R as master chain code. In case I_L is 0 or >= n, the master key is invalid. 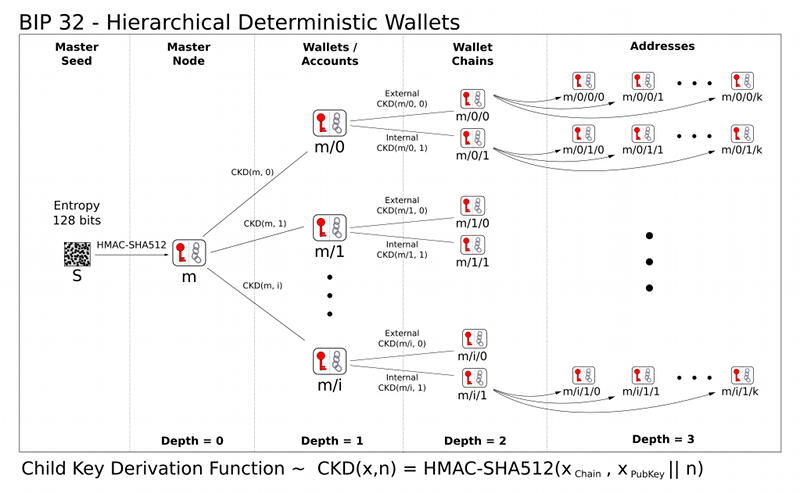 An HD Wallet is organized as several ‘accounts’. Accounts are numbered, the default account (“”) being numbered 0. Clients are not required to support more than one account, if not, they only use the default account. Each account is composed of two keypair chains: an internal and an external one. The external keychain is used to generate new public addresses, while the internal one is used for all other operations(change addresses, generate addresses, anything that doesn’t need to be communicated).